has become quite crowded due to its growing popularity. The product is Nagsasa Cove in Sitio San Martin - offering a kilometer of fine beach within the realm of the Aetas. The beach, like Anawangin's, was created from volcanic material arising from the eruption of Mt. Pinatubo. The beach, however, is just one of the many rewards of a Nagsasa adventure. Initially there will be a river crossing, followed by trekking up Mt. Nagsasa which offers a view of the Cove much in the same way as Mt. Pundaquit offering a view of Anawangin Cove. Then, aside from the beach at the end of te trail, tere are also a mini- waterfalls where you can take a dip for a freshwater experience. The Nagsasa trip can definitely accomplished as a daytrip but the pioneers of the trek are recommending a relaxing, overnight trip. What is remarkable with the Nagsasa trek is that it is relatively very easy; a perfect introduction to the elements for beginners. At the same time, it succeeds in presenting an alternative to Anawangin Cove. Another proposed alternative is Silanguin Cove - featured in PinoyMountaineer.com in 2008. But whereas one has to climb Cinco Picos to reach Silanguin following the trek-to-beach pattern set by Anawangin, in Nagsasa the trek is much easier. 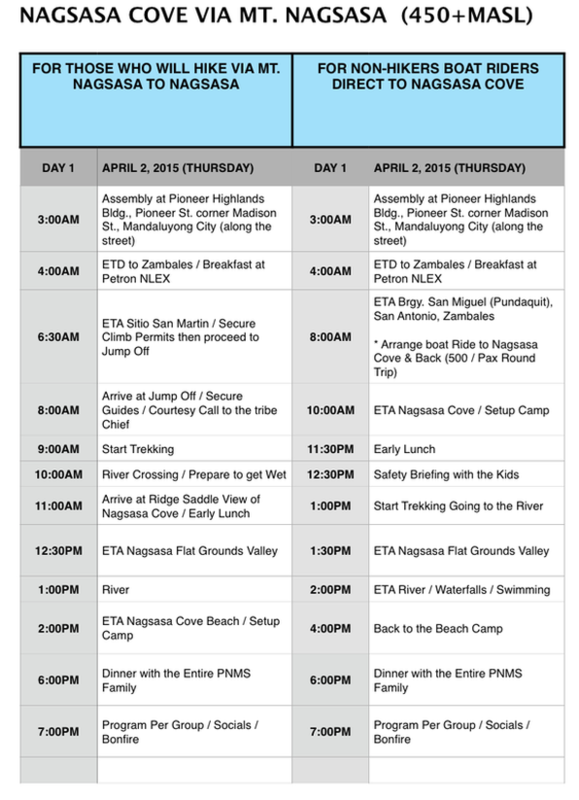 With our only reservation being the safety of the river crossing, PinoyMountaineer.com is recommending the Nagsasa trek and we look forward to more explorations in Zambales from YABAGMC. THOUGH WE HAVE ARRANGED SPECIAL TRANSPORTATION FOR THE GROUP, WE HAVE INCLUDED “HOW TO GET THERE” VIA COMMUTE SO IF YOU WISH TO FOLLOW THERE. Buses ply the Manila-Olongapo route quite regularly. Victory Liner operates the route from its Pasay (LT 1900H), caloocan (LT 2100H), Sampaloc (LT 1900H), and Cubao terminals. The fare is around P200. Just like in Cinco Picos and Balingkilat climbs, a jeep may be rented from Olongapo to the jumpoff (Sitio San Martin) and from there, make arrangements with the Aetas. By the way, prior to the climb it is important to secure a permit from the municipality and/or local police. Of special concern is the river crossing before reaching Mt. Nagsasa. Considering the accident-proneness of nearby Anawangin Cove, we strongly advise future explorers to follow the YABAGMC's practice of roped crossings. Also, severe weather is a contraindication to climbing Nagsasa. The river crossing is one of the highlights of the trek to Nagsasa Cove. Going up Mt. Nagsasa, one is offered a view of Nagsasa Cove and South China Sea beyond it. One of the attractions of the beach is a nearby waterfall. The beach itself is of fine volcanic sand from Mt. Pinatubo's eruption in 1991. The first exploration of Nagsasa Cove following the above itinerary was performed by YABAGMc on August 29, 2009. The first open climb took place a month later, on September 19-20, 2009. *The itinerary was revised by PNMS based on our program of activities. Some of the factual information included here is courtesy of PINOYMOUNTAINEER.COM. PNMS would also like to acknowledge YABAGMC for the details.